Samsung sealed the battery compartment of the new S6 flagship for the first time in its flagship line history, in order to make the thin metal-and-glass fusion that comprises the Galaxy S6 chassis. This unibody construction eventually allowed it to use the so-called premium materials for the casing, i.e. anything that is not plastic, but there is a catch. Obviously, now you can't just pry off the rear cover, and swap the battery at will, like you used to be able to with all Galaxy S flagships so far, but one thing caught our attention while examining the Galaxy S6 user manual that was outed last week. 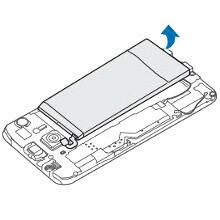 Towards the end, Samsung has placed a section titled "Removing the battery (non-removable type)." While this might sound paradoxical, there is actually a way to replace the dead battery in your Galaxy S6, though it includes removing the rear half of the chassis, which is apparently the easy part, since then you have to unscrew and remove the circuit board, then unplug the battery pack connector, before you place in the new one. Not exactly as straightforward as swapping a spare you carry in your pocket, but it's nice to know that if the battery proves defective for some reason, you will be able to take the S6 to the nearest repair center, and have it replaced fairly quickly. No, most of them are glued. I guess i could live with this solution, but still want my microSD slot. If you look at it this way, every battery is replaceable. It would be nice if you could get the microSd card in this way. Well, at least there's that. Beats the HTC Ones' when it comes to repairability, which get a sold 1 out of 10 from ifixit.com. Hopefully no excessive glue amounts are involved. Some people on this site are just plain thick. Have a think before you type. I'd like to see you try this on any HTC one or any Xperia z series phone.. Although it does need a blow dryer, a blade and a suction cup. Also, drying up the glue using a blow dryer is a risky affair. Samsung's way is much more easier, faster and less chances of you damaging your phone. You also need a blade, suction cup and blow dryer to open up GS6 back cover + screw drver for the battery. However, it voids the warranty. I don't know many mainstream consumers willing to chance this. John B. You need to replace it to avoid explosion. great to know means i can easily repair it myself if something happens to the battery, unlike my current phone the htc one m8. how can you remove the glass back of the S6 if you dont use a suction cup and/or a blowdryer to melt the adhesive? do you think that it can just magically pop out when you remove the sim card tray (as in the manual)? You will need the same tools to open up Xperia Z to be able to open GS6 back cover + screw driver for the battery. I could live without removing and replacing the battery, but i cant live without sd card. Been there with HTC One X 32gb and ill never do the same mistake again. Nice. now all i need is a screwdriver!